This image shows the price of yoghurt and orange juice at North Mart in Inuvik, NT. in November, 2011. The image shows a 650 g plastic tub of Activia strawberry flavoured yoghurt priced at $8:09 CAD. 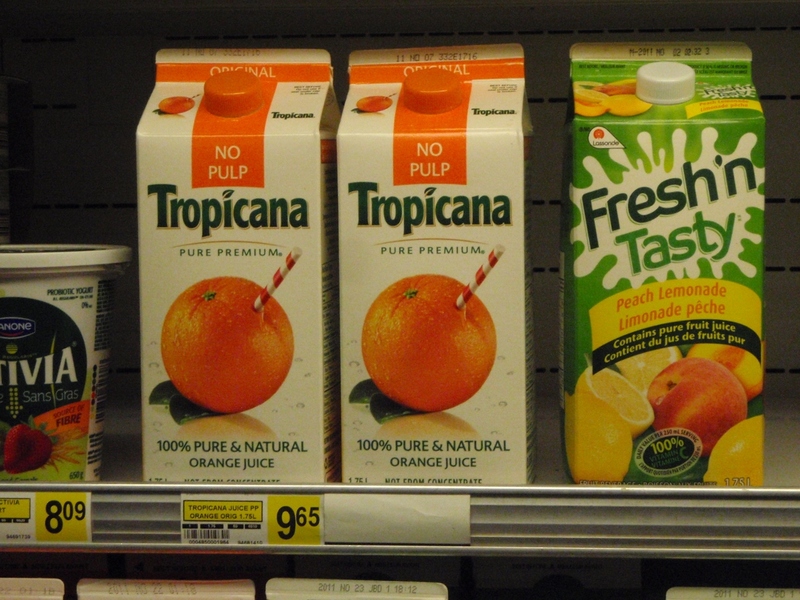 In the centre of the image are two 1.75 litre cartons of Tropicana original, no pulp, pure premium, 100% pure and natural orange juice, not from concentrate, priced at $9.65 per carton. Artwork on the cartons shows an orange, with a red and white drinking straw protruding from the top right side. The orange is sitting on two green leaves. To the right of the image is a 1.75 litre carton of Fresh 'n Tasty Peach Lemonade. Artwork on the carton shows peaches and lemons. Wording on the carton reads "contains pure fruit juice". A medallion indicates 100% Vitamin C daily value per one 250ml serving. There is no shelf-price label for this product.